The Perth Mint is the official bullion mint of Australia, producing a number of coins for collectors and investors. It deals in both silver and gold pieces and, notably, some of the most popular bullion coins in the world, highly prized by investors. Although it is the “official” mint, the Perth Mint doesn’t produce the country’s circulated coinage. This is the job of the Royal Australian Mint. The Perth Mint produces bullion coins and bars, as well as rare pieces. This allows them to focus on the collector/investor market, which is perhaps why they have excelled over the last couple of decades, often listed as the best producer of bullion coins and numismatics. Its coins are, however, classified as legal tender, in most cases. The Perth Mint was founded as a branch of the British Royal Mint. Two others were created at the same time in Sydney and Melbourne. Their purpose was to serve the British Empire, refining gold from Australia’s many gold rushes, and also minting gold sovereigns for the British Empire. It was officially established in 1899, with the unification of the Australian commonwealth, known as the Federation of Australia, occurring two years later. Headquarters is a beautiful structure designed by George Temple-Poole in Perth, Western Australia. The mint would help to serve a growing population, as Australia expanded following the discovery of gold. The wealth and opportunity that this brought, as well as the flood of prospectors who turned to the mint to convert or sell their gold, saw the Perth Mint grow and prosper. Although it was not the official mint for Australian coinage, the Perth Mint did produce some lower denominations. In 1957, it was also producing the purest gold in the world, with a 400 gram gold bar that was 999.999 pure. In fact, this so impressed the Royal Mint that they ordered several of the gold bars and began to use the same methods to produce their own gold. The Perth Mint remained under the jurisdiction of the British Empire until 1970. Many of the silver and gold coins produced by the Perth Mint carry high purity levels, unique designs and limited runs. Even in the case of their popular bullion coins, they still produce them in limited numbers with new designs every year. That’s one of the reasons why the Perth Mint is so popular with investors, and it means that even bullion coins can develop numismatic value over time. One of their most popular products is the Lunar Series, which features new animal designs every year. These have included spiders, kangaroos and koalas. Coins come in many sizes, from a half-ounce to 1 kilo. 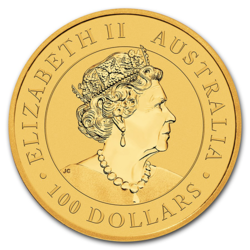 The 1 ounce coins tend to be the most popular, available in silver and gold. They are now integrating color into some designs, although these are rarer and never come at spot price. The Perth Mint also deals in other precious metals. In 1995, they came out with their first palladium series, producing a coin that featured an emu. This was followed three years later by a platinum coin that was 95.5% pure. The Perth Mint once produced a couple of legal tender coins at weights never seen before. These were a 10 kilo Lunar Gold coin and a 1 ton gold coin depicting a kangaroo. These were valued mainly for their enormous precious metal content, but also because of their rarity. You won’t find many Perth Mint coins on lists of the world’s most valuable coins, as these tend to be dominated by those produced by the US Mint and the Royal Mint. That only accounts for numismatic coins worth more than $1 million though, and there are still many expensive and rare Perth Mint coins with lower valuations. Early editions of coins from either of the two Lunar Series have generally increased in value by a considerable amount over the years. The same goes for any coins produced by the Perth Mint more than 10 or 20 years ago, as they all have varying degrees of low mintage.